Opponents Call to Restore Funding to Medicare, Medicaid Programs NBC CT News By Jamie Ratliff Dec 14, 2017 Those affected by cuts to the Medicare Savings (MSP) and Husky A Medicaid programs joined together on Thursday to demand the cuts be fully restored. About 113,000 seniors and people with disabilities are expected to lose MSP coverage unless the legislature acts. Connecticut Citizen Action Group Organizing Director Ann Pratt says increasing taxes on wealthy people could preserve health coverage for people with less money. Pratt says under both the Democratic and Republican proposals, large numbers of low-income people would lose health coverage under Medicaid. Click to watch video. CCAG Fights To Save The Citizens Election Program. AGAIN! ​Counterattack at GOP effort to repeal public financing (article link) Sen. Heather Somers, R-Groton, says she is grateful that she never ran for state office in the days before Connecticut’s public financing system, when a major portion of fundraising took place in Hartford and was geared to collecting checks from lobbyists and their clients. But that didn't stop her from voting Friday for a budget that would repeal the system. (2017 Budget Threat)​ CCAG Exec Dir Tom Swan at left. Photo: Dannel MalloyFlickr/Creative Commons- Sign the Petition! 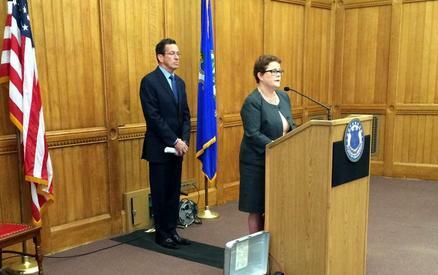 Governor Malloy- Do Not Go Back to Days of "Corrupticut"! The International Business Times published a blockbuster story on the proposed sale of Cigna to the Anthem Corporation, which would create the largest health insurance corporation in history. The story describes the egregious conflicts of interest that our Insurance Commissioner has in participating in any aspect of the review process, including having recently served as a lobbyist for Cigna, her husband still working at Cigna, and her arranging for regular phone calls with the companies to discuss progress in other states. On top of that, the story outlines how these companies have been giving money to political committees related to Governor Malloy in a manner that reminds us of the dark days of John Rowland. If this isn't bad enough, the Insurance Commissioner just announced that she had chosen not to hold a hearing or any public process on the Aetna/Humana merger six months before. Her refusal to use any of her leverage to protect Connecticut jobs and consumers in this proposed deal, combined with her unethical behavior on the proposed Cigna deal, says to us that she is still working for the insurance companies in stacking the deck against the rest of us. Thank you to AARP for taking the lead on this and to all of the CCAG allies and members who showed up at the hearings, wrote letters, made calls to legislators, and to all of the legislators who championed this bill!